1. Each coach looks at their Treasury and decides if they will spend any of the gold on Inducements. This gold is transferred out of the Treasury and immediately increases Team Value accordingly. For example, if Jim had a Team Value of 1,250,000 gp and decided to spend 100,000 gp from his Treasury, his Team Value would increase to 1,350,000 gp even before he announces to his opponent what he plans to spend that gold on. 2. The coach with the lower Team Value is granted an additional amount of ‘petty cash’ equal to the difference in Team Values as they are now. To continue the above example, if Jim’s opponent, Bob, had a Team Value of 1,100,000 gp he would be awarded petty cash of 250,000 gp. That is 150,000 gp for the initial difference in TeamValue, and an additional 100,000 gp for the gold Bob has removed from his Treasury to spend on Inducements. Note here that if Bob took any gold from his Treasury, that amount would also be added to his Team Value, therefore the amount of petty cash awarded would be decreased accordingly. 3. 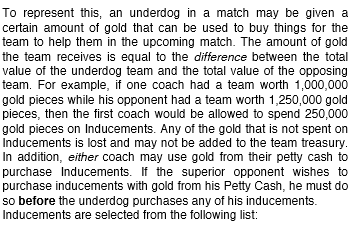 Next, the coach with the higher Team Value decides what they will spend the Gold they transferred from their Treasury on, so in our example, Jim now declares that he will spend his 100,000 gp on a single Bribe Inducement. 4. Finally, the coach with the lower Team Value spends their gold on Inducements, so to complete our example Bob would decide what he is spending his 250,000 gp on, purchasing a Bribe, some Extra Team Training, and a Bloodweiser Keg for the upcoming match. Wording from CRP: In summary, the majority of BB players (I believe) understood that the ruling changed from CRP to BB16, with the difference being that the “overdog” could spend Treasury without it affecting their TV – basically – the initial difference in TV was the cash boost that the underdog got. This appears to contradict that, and the Facebook answer says there will be a published FAQ at some point to clarify this. I guess the important point is that in a league you can play however you like, and what people understood from DZ1 is an alternative to CRP. Most leagues have chosen between the two. I’m posting this to present the information in a non-inflammatory way, so that people have all the information to hand rather than in trickling out.